No, FIKA is not a desi slang word. It is actually a Swedish concept which means "having coffee" or "Taking a Coffee Break". 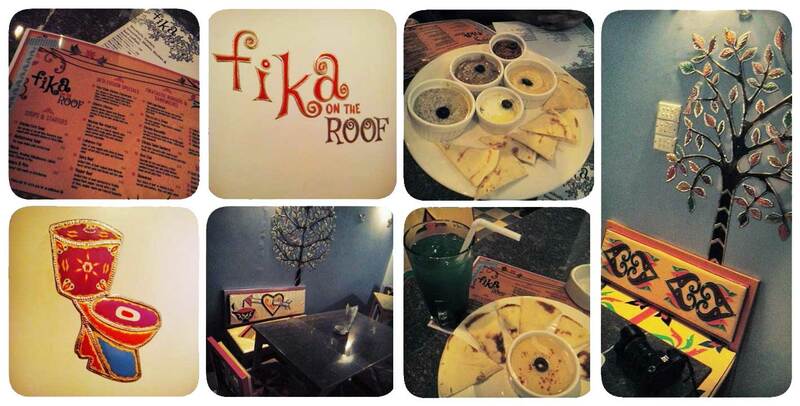 FIKA started as a cafe in Karachi and their seafood chowder became a Hot topic. Recently they opened up a roof top eatery in the same space called "FIKA on the Roof" and I went to a private Blogger party to try out their menu. The AMBIANCE was just right. Even though it is inspired by Truck art (some may say Rikshaw Art, its the same genre) it was not overdone like most inspired places. It utilized just the right amount of inspiration through elements in their interior which made it comfortable rather than overbearing. The lighting was also not too dim and I could see my food, very important. The menu is a mix of Fusion food. You can find Mezze platter, Mulligatawny soup, Mexican Chicken, Gulab Jaman and LachaaDar Paratha with chai, all in the same place with so much more! I always find this concept exciting. Feedback is appreciated and even taken under consideration by the staff and owners. No frowns were seen when I suggested a few things to them. They definitely get brownie points for that. I started with the Mezze Platter and Cheshire Cat. Mezze platter, many are acquainted with, is an appetizer dish. It is an assortment of dips with pita bread served on the side. Its a Middle Eastern specialty. Cheshire Cat was a zesty drink which tasted like Pakola mixed with lime and mint, very refreshing. After more fellow bloggers arrived we placed our main orders. I tried Cacciatore Chicken which was simply delicious. The flavors of spicy chicken with tomatoes served on a bed of creamy pasta were balanced out perfectly. The spices used could be felt on every taste bud. My fellow bloggers Umair Mirza had Cilantro chicken and Sidra Rizvi had Mexican Fish. Our plates was literally licked clean. I later ordered another drink called "Heaven on Earth" which was apparently was a secret recipe of the owner. Believe me, no matter how much I guessed, along with others, we were not able to figure out what made that drink so delectable. The guessing game was fun. Abid Merchant, the owner, gave in after pressure and told us the secret. However I am not sharing because I want you to go try it yourself and guess as well! The palate driven evening came to an end with Gulabo, a simple dessert consisting of hot Gulab Jaman with a scoop of vanilla ice cream. FIKA on the Roof is ideal for a night out with friends and family. It has a very comfortable atmosphere which puts you at ease. You too PAOLA :0 Thanks for stopping by!